Getting ready to go Back to School. We have some suggestions for both Adults and Children to keep safe. 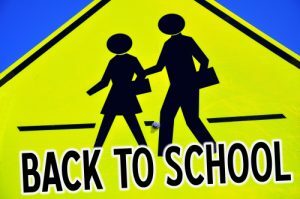 Drivers should remember that as the new school year begins kids will be walking, crossing streets and maybe not be paying attention on their way to school. Parents should talk to their kids about getting to and from school safely. Modesto City School start on August 13th. 1. Don’t text or talk on your phone while driving. Not only is it against the law it is a good practice to teach your kids. 2. Keep an eye out for hot spots. Marked school zones as well as areas near and around bus stops and bike lanes. 3. Watch out for the unexpected. Children can run out unexpectedly. Make sure you follow the speed limit. Yield to crossing guards and be aware of your surroundings on the road. 4. Yield to school buses. Don’t try to overtake the bus or go around it. If a bus has a flashing, alternating red light, you are legally required to stop and wait for the light to turn off. 5. Give yourself extra time. School areas are congested, allow for more time to get where you are going. This will help alleviate stress and avoid accidents. 1. Make sure to practice crosswalk safety. Parents tell your kids to cross streets only at crosswalks or stoplights and to always look both ways before crossing the street. 2. Use the buddy system(it has worked for generations). Make sure you have the contact information of your child’s walking buddy and know their route. If a child is under 10 an adult should walk with them. 3. Make sure you wear proper bike safety equipment. Make sure you wear your helmets, light colored clothes. Parents also make sure the lights and reflective devices are in place. 4. Avoid Danger Zones. Tell your children to avoid walking or riding bikes behind school buses and other dangerous blind spots. 5. Practice school bus safety. Instruct your children to be careful when exiting the bus. Bus fatalities can occur when kids run out in front of the bus. Remember everyone is responsible to drive with extra caution in School Zones.